As a young person, Shiv Charan had a number of nearly fatal incidents and these near death experiences gave him an intimate knowledge of the process of living and dying that we all seek to understand. As an adolescent he experienced full Kundalini rising, a term used to describe profound spiritual awakening. 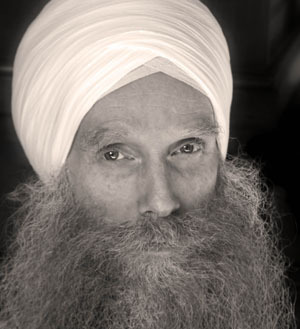 In his early twenties he studied Sikh Dharma with Siri Singh Sahib Bhai Sahib Harbhajan Singh Khalsa, the religious leader and founder of Sikh Dharma in the West. Over the last ten years he has run the vibrant and cosmopolitan Karam Kriya School in London which offers a number of courses including an accredited teacher training in Kundalini Yoga, a form of yoga specifically practised to develop spiritual awareness. The science of Applied Numerology can be studied which provides a tool for understanding the harmony and inter-relatedness of all things. Karam Kriya Consultancy is a three-year course that focuses on communication and relationships. Through the living word of the teachings he invites us to fully realise our spiritual potential as human beings without the renouncement of worldly things. God is within and without; we are both part of the universe and the universe itself. Through the practice of Kundalini Yoga and meditation and using the tools of Karam Kriya and Applied Numerology, we can move beyond our fears and suffering and live in the light of our highest consciousness. Shiv Charan Singh is neither self seeking nor political in his teachings. He is entertaining and both charismatic and humble in the way he speaks. Following a degree in humanities, he has undertaken extensive training in counselling and therapeutic skills. He has worked intensively and successfully with people who have drug habits and severe emotional problems, and he offers profoundly transformative individual counselling. Above all, his warmth and compassion have generated a community spirit at the school which reaches out to the community regardless of age and background, and attracts people from all over the world.